For over two decades Lokar has manufactured products of the highest quality, exceeding industry standards, raising the bar for quality products and leading the way for a better automotive aftermarket. We dedicate ourselves to providing all customers with original and innovative products. This dedication has translated into an unwavering reputation that we are proud of and which customers remind us of every day. When one builds a company on Honesty, Integrity and Class, everything else falls into place. Lokar is a name built by our customers. Lokar is committed to providing quality custom automotive products. Quality... Plain and Simple! PitStopUSA.com offers a variety of Automatic Transmission Controllers from the biggest brands in drag racing including TCI Automotive Automatic Transmission Controllers and more at low everyday prices. Check out the Recently Listed Automatic Transmission Dipsticks. Check out the Recently Listed Automatic Transmission Kickdowns. The best way to stop missing shifts on the street or strip is to ditch that stock shifter and step up to a high performance shifter. Avoid engine and transmission damage with reverse and neutral lock-out the track. Pit Stop USA sells all the products you need for your 3/4 and 1-ton GMC or Chevrolet Trucks including Interior and Accessories. Pit Stop USA sells all the products you need for your 3/4 and 1-ton GMC or Chevrolet Trucks including Oiling Systems. Pit Stop USA is The Online High Performance Superstore! We feature Door Handles and Window Cranks at low everyday prices. Check out the Recently Listed Door Handles. Pit Stop USA is The Online High Performance Superstore! 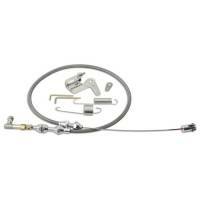 We feature Door Lock Cables at low everyday prices. Pit Stop USA is The Online High Performance Superstore! We feature Emergency/Parking Brakes at low everyday prices. Check out the Recently Listed Engine Oil Dipsticks. Cage and Universal Adjustable Angle Mount ET Dial-In Board and Brackets from PitStopUSA.com mount onto cage without interfering with roll-bar padding. Remote Displays display your dial in with a super bright 4" tall LED read out. Check out the Recently Listed Exhaust Y-Pipes. It is Lokar’s steadfast belief of “Made in the USA”, that sets us apart from others. It would be easy to stray from that belief given the state of the economy and the ever increasing foreign influences, but American Made is the foundation of this company and we continue to stand by it. While striving to provide you with superior products, we also look to the demand in the market place and work to provide you with the most useful and needed products possible. We are not here to simply fill a catalog with parts; we are here to provide you with things that you can use. This year we are excited and proud to introduce a new series of products within our Midnight Series; the Black Stainless Steel Housing Line some of which includes transmission and engine dipsticks, throttle cables, kickdowns and matching mounting brackets. This black stainless steel housing has everyone excited and provides a new option for your vehicle. Please check out these products listed throughout the catalog. We are confident that you will find something that you need, or just can’t live without. As always, thank you to all of our customers, past, present and future, for contributing to the success we have experienced over the many years since our inception. We always appreciate your business, support and patronization. Lokar promises to continue serving you with Quality…Plain & Simple.